Monday afternoon after most of the Ebbtiders went their separate ways, a group of five remained to explore the world of food. This week’s adventure: the Royal Unicorn restaurant. After some wrong turns and mild panic, the five approached the venue. They were greeted by an old neon sign with run-down exteriors and an exotic, round entrance. Proceeding with caution, the adventurers entered through the wooden doors and were pleasantly greeted and seated at an appropriately sized booth with fancily folded napkins. 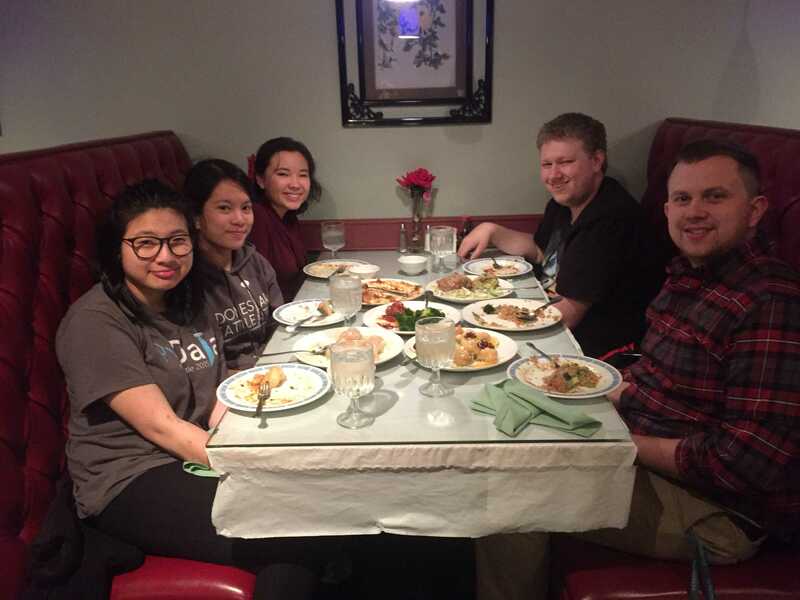 The hungry five eyed their menus searching for something delicious and decided on these seven dishes: veggie steamed dumplings, veggie fried rice, almond chicken, General Tso’s chicken, veggie egg foo yung, honey walnut prawns, and ma pou tofu. The food arrived in a timely manner. First up, the veggie steamed dumplings. A single order contained six dumplings and sauce for their dipping pleasure. Each person devoured their dumpling. The first bite burned from the heat of the filling, but the delightful flavor and pangs of hunger subsiding convinced them to finish. After five were eaten, there was only one left. Two people eyed the final dumpling, and so the death match began, only to be ended shortly after with the arrival of the veggie fried rice. Another fantastic dish, the veggie fried rice soothed the remaining pangs of hunger. An excellent transition to the next dishes, almond chicken and General Tso’s Chicken. The almond chicken put up a fair fight, but it was overwhelmed by the deliciousness of the General Tso’s chicken that was loved by all, except the one vegetarian among the group. Finally the last three dishes arrived, veggie egg foo yung, honey walnut prawns, and the ma pou Tofu. The veggie egg foo yung was slowly eaten. Though still scrumptious, after everything else was eaten, little room remained. Honey walnut prawns were the favorite dish for a couple of the newsies, but the ma pou tofu came out on top. An addicting dish, the ma pou tofu comes in different levels of spiciness and is not for the faint of heart. But for those strong enough to endure the heat, you will be rewarded. After all had their fill of food, little leftovers remained. Though, to their shock, they had racked up nearly $20 each with tip, but none had regrets. What a wonderful adventure, one well recommended and endorsed by the Ebbtide.